Celebrating PBP’s 10th Anniversary with a Lolly Bag Sale! Both bags equal 1 full (and fun) Collection! Save an additional 10% OFF when you purchase both bags! Use Coupon Code: CBJLOLLY and get a 9th pack FREE! Good through August 1st only! Check out this fun camping collection from Meagan’s Creations! Save 30-40% off this wonderful collection for your summer time memories through Monday, August 1st! I have a new set of smart paper templates in my store for PSCS/CC users. Whip up custom pattern paper in a couple minutes. So fun! Tutorial included. In addition to our new releases, and current sales and specials, I’m going to bring you some oldies but goodies. Check out these fun products from the archives of some of our favorite designers. 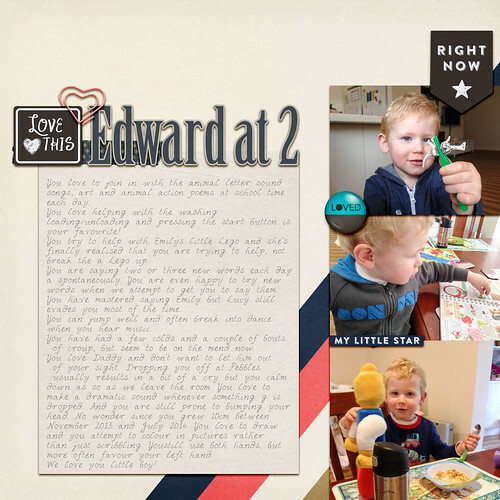 Check out these adorable templates. I love the starburst one. It reminds me of a lighthouse! If you celebrated any Christmas in July events, or are just catching up on your holiday pages, this kit is a gorgeous option. Baersgarten’s party printables are adorable. This monster set is sure to please your kiddos! This kit is quintessential Vinnie. Perfect for any art lover. This past week I was in Wisconsin helping my parents move their home and belongings from Montana to the Madison area. They’re at the age when they really can’t do it all on their own. As I was helping unpack, I came across many photographs and other mementos from my childhood. Some of these things were items my parents intentionally saved, and some were simply things they just hadn’t gotten rid of. My parents’ photos were in dozens of different places with no organization strategy. This, of course, meant a lot of my time was spent going through items in an effort to help sort through everything… and to reminisce. Some of the photos and items are things I had seen before and knew were at my parent’s home. Other things surprised me because I had forgotten about them and/or hadn’t seen them since I was a child (or ever!) I definitely had no idea my parents still had them. It fascinates me how the brain works — I can go thirty years without seeing or thinking about a book and the instant I see the cover, a flood of memories washes over me. As I sorted though things, it was tempting to make a big pile of photos and items I wanted to take hime with me. Knowing that my parents had no use for them made it even more tempting. However, as my pile grew, I started to realize I needed to ask myself the question I often ask others: do I really need this? As a scrapbooker and photographer, I am definitely sentimental. There is no denying it. But, since we have moved so many times, I have also learned the value of having less stuff. A few years ago I wrote a post titled Moving the Memories (sorry the images aren’t showing up….tech problems!) In it I shared some tips for dealing with memories and mementos in the process of moving. Through that specific move, I really learned how to let go of things without letting go of the memory. My main strategy was (and is!) to take photos of things I know I will never use or need. Although my white stuffed bunny from when I was little is a sweet nostalgic memory, I don’t need it. And yes, I could give it to my children, but they don’t need it either. What family with little kids really needs another stuffed animal? The same is true for a number of books, trinkets, and other odds and ends. Yes, they are a memory but no, I don’t need them. So with just my phone camera (I didn’t even bother pulling out my big camera), I captured important memories without adding more stuff to my house. And now I have new and remembered stories to scrapbook. Win win! So what about you? How do you deal with memories and momentos? Today, I’m going to share with you some of the ways I put these masks into action on my scrapbook layouts. 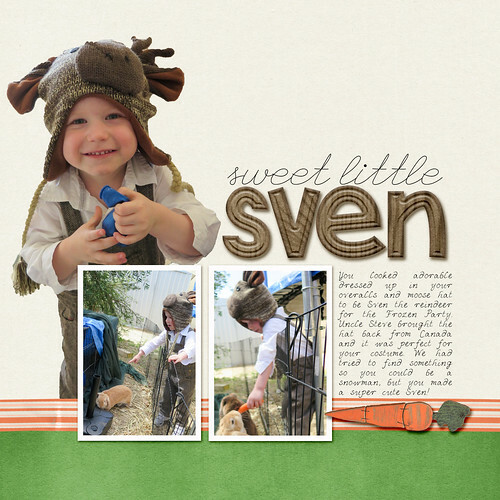 For this page I used the magic wand selection tool and a layer mask to make a cute extraction of my son’s Sven the reindeer costume from a busy background. I just left it unshadowed as the focal point of this layout. You can also use an extraction as embellishments. As I did in this layout from way back in 2008. Do you still have that Shabby Princess Freebie? Make a composite of multiple images by layering them on top of each other (or paper) and use the layer mask to erase parts of the top image. I also used blend modes to create this look. I have used layer masks to take a simple quick page and edit what’s already on the page to add more papers and embellishments. Just erase parts of the papers you add to the quick page to make them looked tucked under the existing embellishments. Here I held down the shift and ctrl keys while drawing the selection to get a perfect square in the centre of my paper. A click of the new layer mask button and voila! Perfect paper layers! You can see the whole process of creating this layout (and editing the ribbon) in my new class coming to Big Picture Classes. One thing I’m always doing is editing paperclips or pins to make them look like they are clipped onto the paper. A tiny bit of masking goes a long way! You can also erase parts of scatters/clusters that cover parts of your layout. But sometimes two photos and a layer mask is all you need! There are many more uses for masks in photo editing. Adobe created masks with traditional photo developing techniques in mind. I’ll often mask an adjustment layer to apply the adjustment to only part of your image (colorize a black and white image or brighten only part of it). How do you use masks? Let’s take a closer look at Joie De Vivre. Layout by Sula. Supplies: Joie De Vivre by Kristin Cronin-Barrow; Oodles of Strings by Sweetshoppe Designs; Flair Builder Template #1 by Mommyish. Layout by JillW. Supplies: Joie De Vivre by Kristin Cronin-Barrow. Layout by SharonS. Supplies: Joie De Vivre by Kristin Cronin-Barrow; Template by Tinci; Font: CK Beauty. Layout by Judie. Supplies: Joie De Vivre by Kristin Cronin-Barrow. Layout by Natascha. Supplies: Joie De Vivre by Kristin Cronin-Barrow; Trifecta22: Bubble Tea (template) by Brook Magee. I am a Canadian designer living in a small mountain town in British Columbia, Canada. I live here with my husband and our two kids, Lily and Lucas. We love the quiet small town life. Sometimes it gets hard and a little lonely when you are as isolated as we are but we have a great sense of community in this little town. I first started with graphic design in 1998 when I was attending college for Visual Arts. I instantly fell in love with Adobe Photoshop. I worked for a few years after college in a small printing company and then eventually was lucky enough to begin working full time at home designing my own scrapbooking supplies. 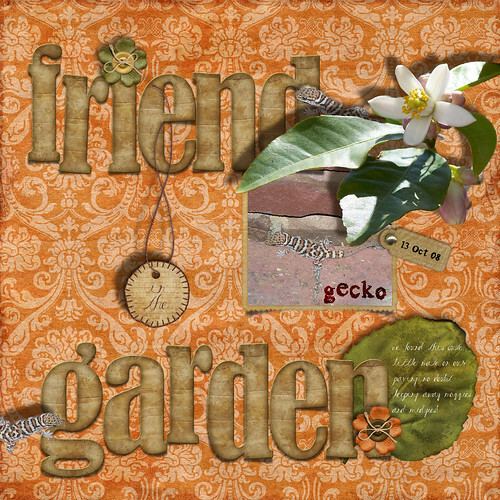 I discovered digital scrapbooking in 2003 when my daughter was born. At the time digital scrapbooking was still so new and there weren’t stores like there are now. I started designing products in 2004 and I sold at a few stores until I found my forever home with sweet shoppe designs in 2007. It is such a wonderful job that has led to so many amazing opportunities. Sometimes I really do have to pinch myself with what I get to do for a career. Art and being creative has always been such a huge part of my life that it is just amazing I get to play all day and call it work! This is a layout I did that focuses on one of my favourite places I’ve ever been in Canada. Moraine Lake is gorgeous and it is near Banff, Alberta. I enjoyed using this fun template from Brook Magee designs. I started scrapbooking digitally in April 2003 when my daughter was 3 months old and haven’t looked back! I started designing in 2004. Anything and everything! Colors, patterns, quotes, Pinterest.. the possibilities for inspiration are endless. Computer: I have a mac and i’m running (shhh) os 10.8.2 I am really bad with updating my software! I have 2 monitors. I admit that I often use one to binge watch a show on netflix while I work. Program: Photoshop CC and Illustrator mostly. Camera: Nikon D80 and Canon G12.. I am in the process of trying to upgrade because my D80 is pretty much out of use but I’m not sure what I want to update to. Scrapbook for FUN. Remember at the end of the day you started scrapbooking for the memories not to get on a certain creative team, win a contest or get a layout featured somewhere. Remember that these layouts are going to be with you forever and they are what you will cherish in years to come. This basically encompasses the whole reason why I scrapbook and design. I loved the way this one came together because I didn’t over think things which is what I almost always do. I created the floral paper first and everything just seemed to flow very easy from there. I actually don’t like to check my sales so I am unsure what my most popular is but I do think my Christmas collections tend to be pretty popular. This is the one I made this past Christmas. 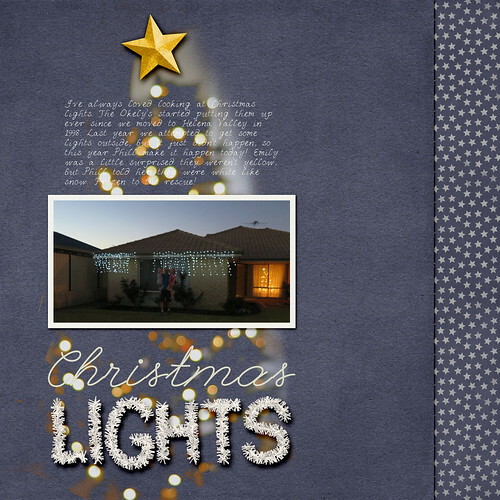 Here are some more inspirational layouts using Kristin Cronin-Barrow’s products. All of the layouts are linked to the originals with credits. Go have a look in Kristin Cronin-Barrow’s store! We will randomly select TWO winners to win $10 in product! All winners will be selected through the Rafflecopter widget below. There are several ways to enter and you can do ALL of them to gain more entries for yourself! Layout by Trina. Supplies: Joie De Vivre by Kristin Cronin-Barrow; Fiddlesticks 6 (template) by Fiddle Dee Dee Designs; Font: Malina.